Learn how to watch Fubo.tv in the UK and elsewhere in this following guide. If you haven’t heard of Fubo.tv in the UK, Europe or elsewhere then don’t worry because not many people have. However, Fubo.tv is actually something extremely special. Fubo.tv is an official football streaming website for US customers and it carries a huge amount of different football leagues and cups from around the world all for the bargain price of only US$9.99 per month (approx £6.80). Unfortunately, Fubo.tv isn’t available outside the United States but in this article I’m going to show you how to watch Fubo.tv in the UK or anywhere else in the world. Fubo.tv shows the English Capital One Cup, Portuguese Segunda Liga, Mexican Liga MX, Mexican Ascenso MX, Spanish Copa Del Rey, French Ligue 1, Spanish La Liga, Italian Serie A and the Portuguese Primeria Liga. On top of those leagues and cups they also show the following TV stations, beIN Sports HD, beIN Sports Spanish HD, Univision Deportes, Univision, Unimas, TyC Sports, GolTV English, GolTV Spanish, Pivot, El Rey Networks, Revolt, Football Report TV, Benfica TV, Sport TV Americas, Fubo TV Network, Galavision, Antena 3, Nuestra Tele Noticias, TeleHit, Bandamax, Ritmoson, Tlnovelas Univision, ForoTV, De Pelicula and De Pelicula Clasico. If that wasn’t enough they also have dedicated shows and channels dedicated to Ajax, Borussia Dortmund and Everton. If you visit the Fubo.tv website outside the US then it stops you from signing up by telling you your email is invalid, even if you do manage to “beat” the sign-up process nearly 95% of the available channels are hidden to you. With a VPN you get access to the full range of services. A VPN is a small piece of software you download for your computer and it allows you to disguise your online location. Basically you can choose another location and any website you visit will think you’re from that location. Where can I get a VPN for Fubo.tv? There are thousands of companies around the world that sell VPN services and most cost under US$10 (approx £6.80) per month but can be as low as US$5 (approx £4.80) if you sign up for a longer period than a month, which for all the Fubo.tv content you’re going to want to watch will likely make sense. To stream video from the US Fubo.tv website you need a VPN service that is fast and reliable and most importantly it needs to have what is known as a US “server” that will allow you to appear as if you are in the US. To save you searching the internet and perhaps ending up with a bad service I’ve put together a list of three of my favourite VPN providers that are all suitable for watching Fubo.tv in the UK and elsewhere in HD quality. I personally use ExpressVPN because I find them the best and easiest to use and they’ve got a risk-free 30-day money back guarantee but have tested all three to be working with Fubo.tv. Just click one of their names to visit their website. 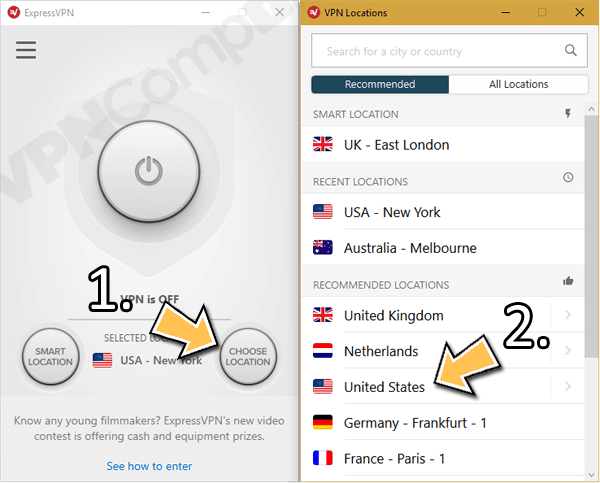 In this example I’ll use ExpressVPN but the process is the same for IPVanish and NordVPN only their software layout differs slightly. Firstly visit one of the VPN providers above and sign-up. Download their Windows, Mac, Android or iOS app. Wait for the software to make connection. Once connected you need to visit the Fubo.tv website and sign-up. Press Start your free trial. Enter your email address and press Sign Up with Email. Enter your name and a password and press Finish Signing Up. Enter your payment details and complete sign-up. Now you’re signed up you can visit the main Fubo.tv website and navigate around to watch the different TV stations and football matches. Each time you log in to watch you must connect to your VPN service like in the example above. When you’ve finished watching just disconnect. You can get a free 7-day trial of Fubo.tv and if you wish to keep it afterwards you get access to a whole range of sports. Enjoy great football in the UK and elsewhere in the world with Fubo.tv! Hi, even running ipvanish placing me in the US fubo TV is telling me i’m in the wrong region. Do you know why that might be? You’ll need to try a few different cities and servers. For example New York – nyc-c07 server works fine. Let us know how you get on. Does it give you a reason? Also can you try an alternative card?